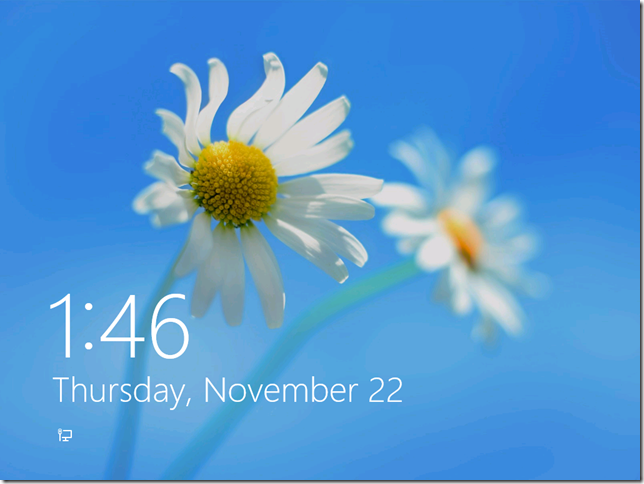 Microsoft recently release the November 2012 Cumulative Update for Windows 8/2012 that enables you to configure the default lock screen image for Windows 8 (See quote below). You may have thought that this image was customisable by the users in the control panel already however this would only configure the image of the lock screen after the user had logged on to the computer. Meaning you were always presented with the Seattle Space Needle cartoon image every time you logged off or rebooted your computer. This image is nice to look at but this is definitely something the would be changed in most corporate environment to display their own corporate logo or a perhaps some disclaimer text. 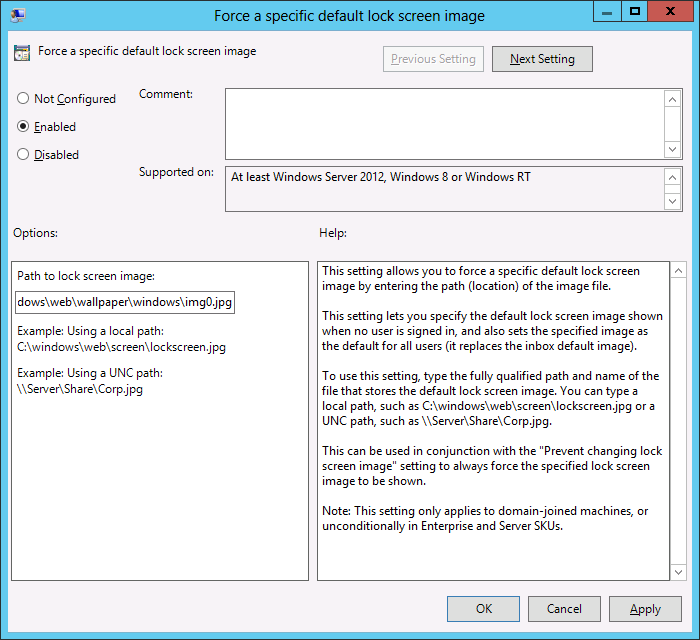 The new setting is called “Force a specific default lock screen image” it can be found under Computer Configuration > Policies > Administrative Templates > Control Panel > Personalization. Note: It will only appear after you November 2012 update is installed on the computer you are editing the group policy object from but you must ALSO apply it to the workstation/server that the setting is being applied. 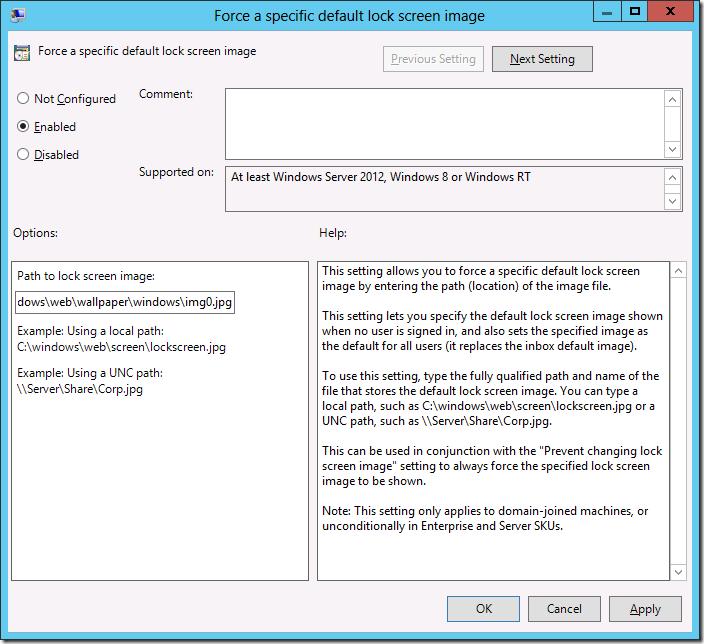 After you have installed it you can then configure the setting to use a different default lock image. Below is an example that I have configured to use the default wallpaper as also the default lock screen image. As you can see the default lock screen image is now configured to be the default wallpaper but you can specify it to be any image file you like on the local HDD or the network. Note: If you apply this to a computer setting to computer without the November 2012 update installed it will do nothing and you will get an “Extra Registry Key” setting when you run a GP Results report on that computer (see image below). I have windows server 2008 R2 (DC) and windows 8 for users , I have install this update but it dose not change the group policy , I need to disable the lock screen wall paper , Is this possible ? Any idea why Microsoft is only allowing this to work for Windows 8 Enterprise? say. But maybe you coulld a little more iin the way of content so people could connect with it better. Does anyone know if you use a UNC path does it copy the image locally or load it directly from the UNC path? has anyone tested if there is any performance impact using a UNC path? Does anyone know why this will not impact for professional editions of Windows 7 / 8.1? Does anyone know if we use a UNC path for this policy? Is there a specific Dimensions that the image needs to be? I just tried this on Windows 10 1607 and now i have no lock or login screens just a blue background now. Good News about this problem? I guess, option of personalization through group policy is not available in Windows Server 2008. Its doable /option is available in Windows Server 2012. Great post. Sad to say that some windows servers out there are experiencing technical problems even though their OS is original.